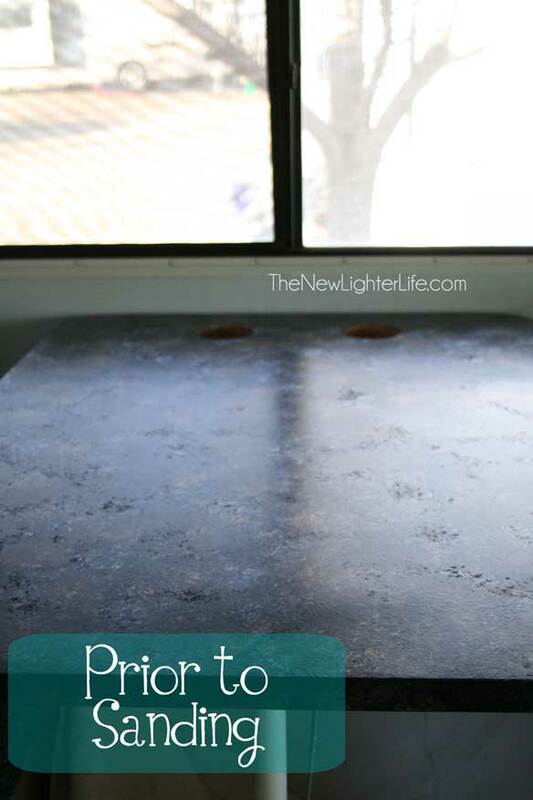 When we did the complete remodel of our 96′ Winnebago camper, we decided to paint our dinette table. But that didn’t turn out so well. 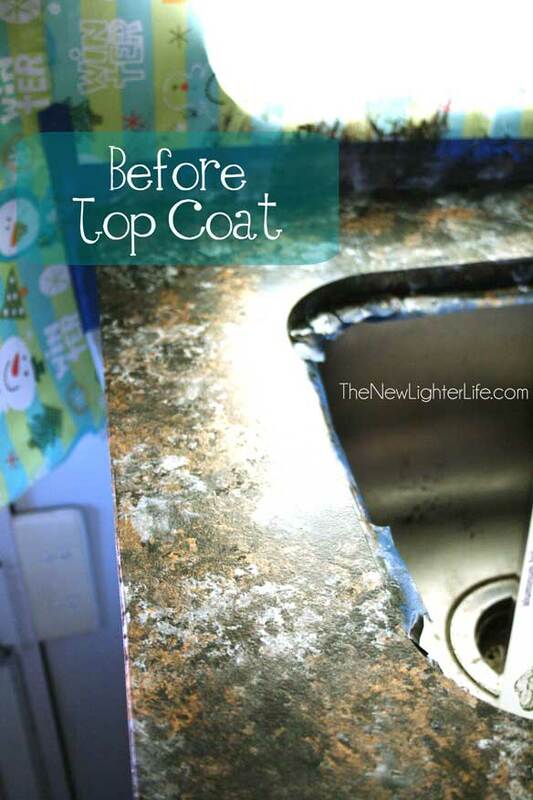 After our disappointment in the countertop paint, we decided to scrape the paint off and try fix the eyesore. 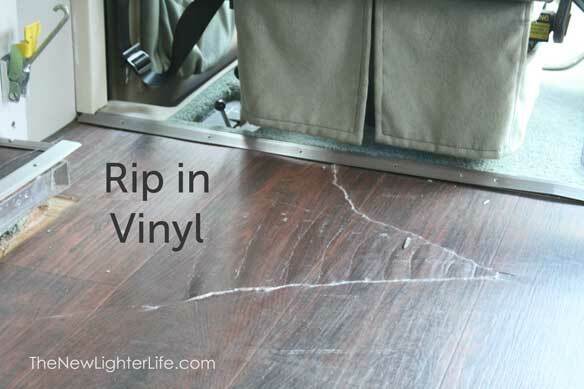 How did we replace our RV flooring? 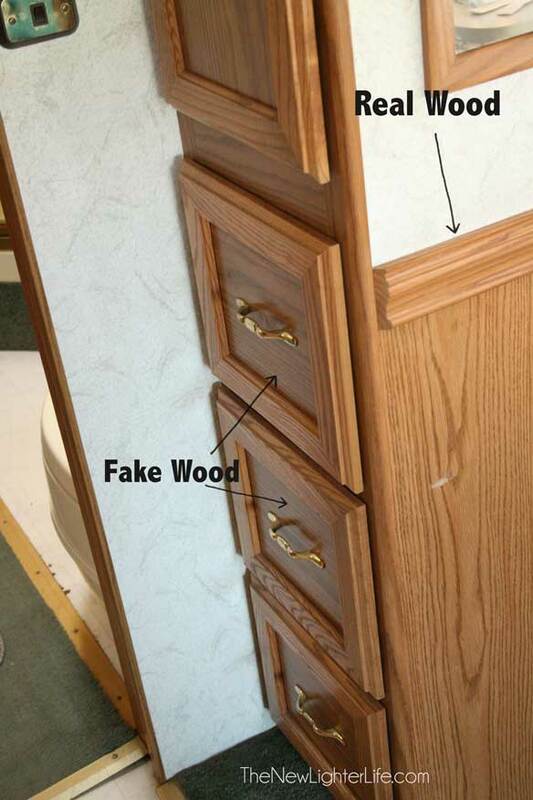 That is a question we’ve received multiple times concerning our RV Remodel. 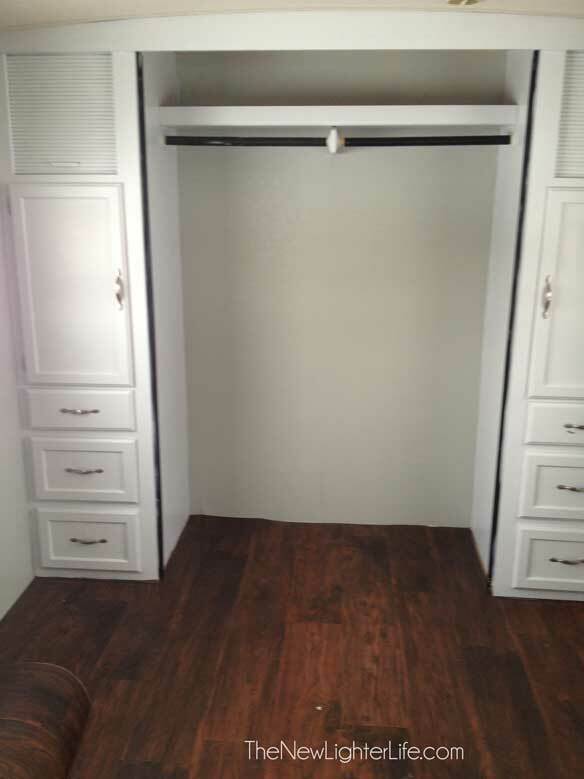 For materials, we scoured the internet and found that most RVers recommend a vinyl flooring sold by Home Depot, Allure Trafficmaster plank flooring to be exact. We did quite a bit of reading about the product and started to find alarming reviews, like here and here and here. 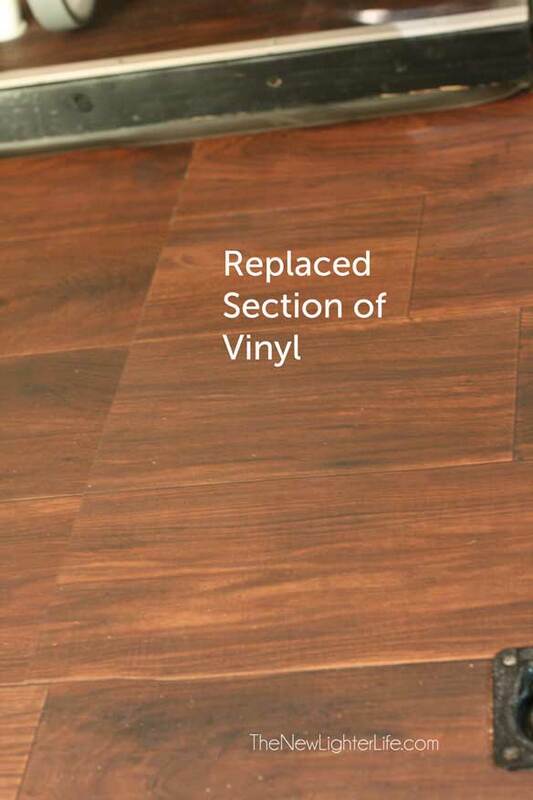 There were a variety of issues but the most common seemed to be surrounding Home Depot’s lack of customer support for the product and how stinky the flooring was once installed (off-gasing). Some people said it took months for the smell to go away and that was with open windows. Since this remodel was done late in the winter, airing wasn’t an option and we sure didn’t have a few months for it to finish off-gasing before we lived in it. The more we read, the more we became concerned. In the end we decided to NOT install Allure. 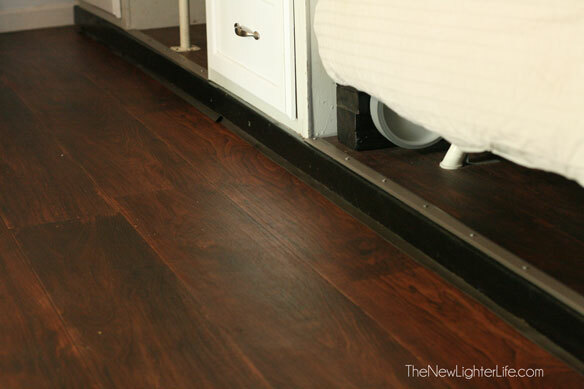 Now in all fairness, I KNOW many RVers use this flooring and have no issues whatsoever. But we didn’t want to be one of the ones that got a bad batch. We then looked to our local Lowe’s to see if they had a similar flooring that was not prone to off-gasing issues. They had something similar, yes, but did it off-gas? It was possible and we weren’t taking any chances so we settled on the most afforable option out there. Mark installed sheet vinyl. Is it stylin’ and amazing?! No. but it serves it’s purpose only cost us about $300 to do our entire camper. 4 months later, we’re very pleased with the flooring. It’s held up well and if for some reason we need to do anything to the subfloor, we can pull up the vinyl and place it back down. Easy peasy. 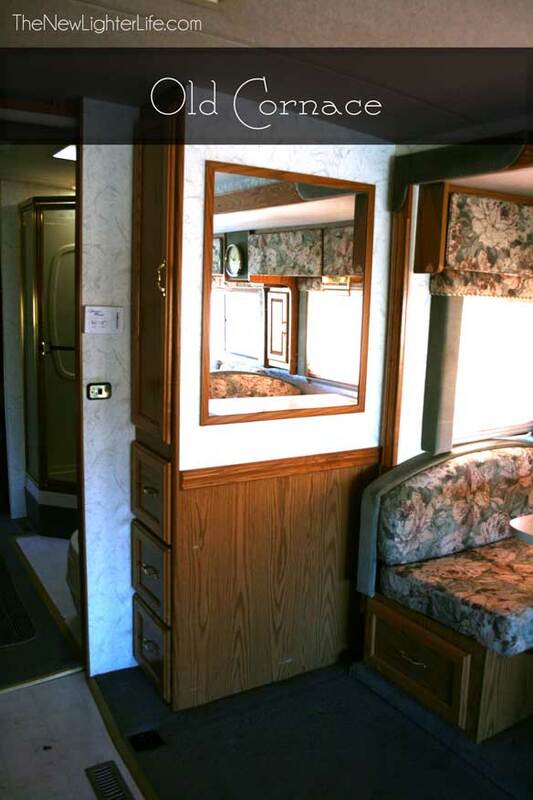 Our 96′ Winnie has one large slide over the dining and living area. Because of the year, it is a raised slide and sits about 3 inches higher, (see crappy picture below). So how do we properly replace the RV flooring on the slide. 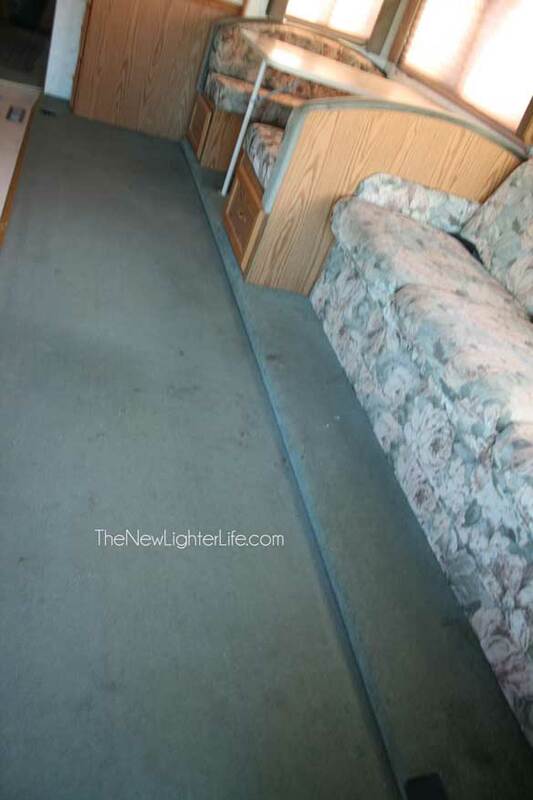 When Mark demo’d the camper he took out the booth dinette and couch and ripped out the carpet in the slide area. We were a bit apprehensive about dealing with a raised slide but after the fact, Mark would tell you it was very easy to do. 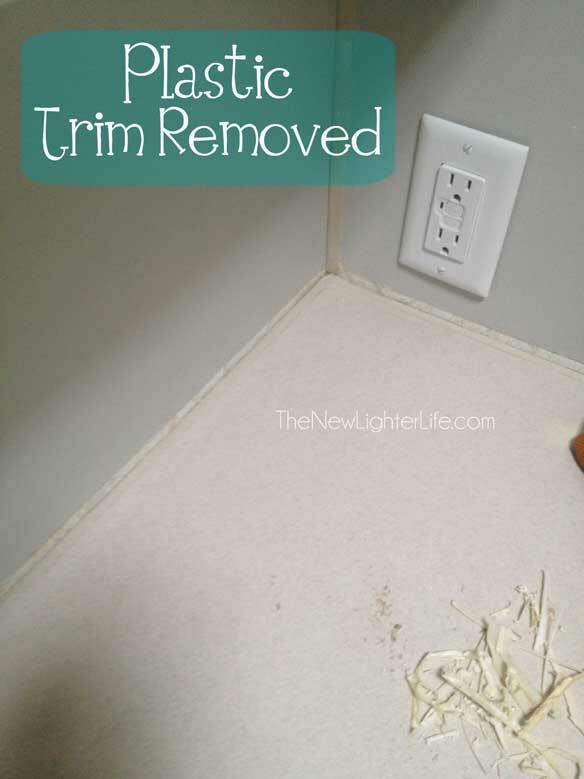 Once all the carpet and staples were removed, he simply laid the vinyl down and trimmed it with wood against the wall and screwed in a metal transition strip along the top at the front of the slide and in the doorways between the bathroom and bedroom. 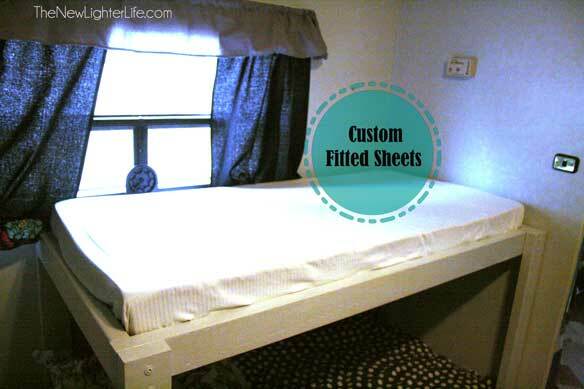 To cover the front, he bought 1/2″ X 3″ trim boards to cover the 13 feet of length of the slide. 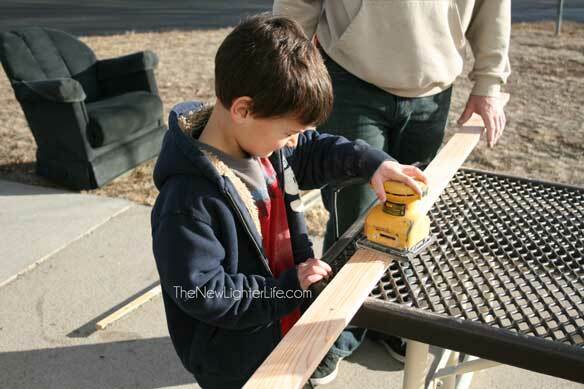 Our son, Eli, was employed in the sanding of the board and Mark stained the wood a dark color. Mark wanted to make sure the slide was sealed so he installed 3/4″ weather stripping all along the slide first. It was screwed right to that metal strip you can in the picture below. 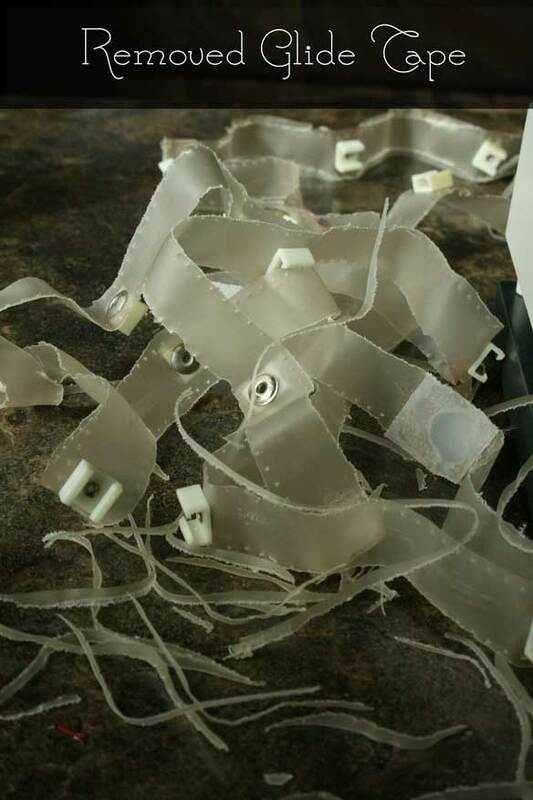 This is the type of weather stripping that is used on garage doors. 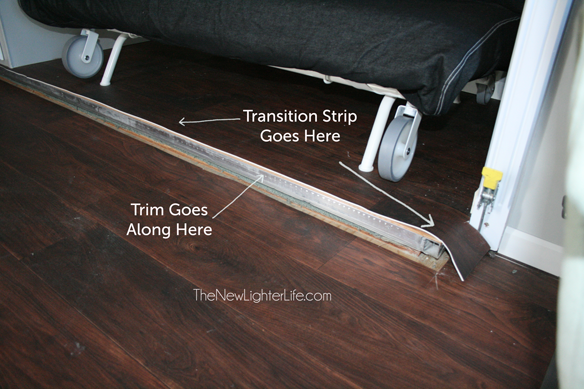 After the stripping was attached, he screwed on the sanded and stained trim board and lastly the metal transition strip was attached to the top outer edge of the slide (and overlaps the front wood trim slightly. So this all worked great and looked awesome. But after taking the slide in and putting it back out we ran into a problem, the front corner of the wood trim snagged the vinyl. It snagged it good. Rather than replace the entire sheet of vinyl, Mark cut out the offending area which was a 1 1/2 foot by 3 1/2 foot area. He cut some fresh vinyl from the scraps we had and tacked it down with 2-sided carpeting tape. In the picture, it is obvious. 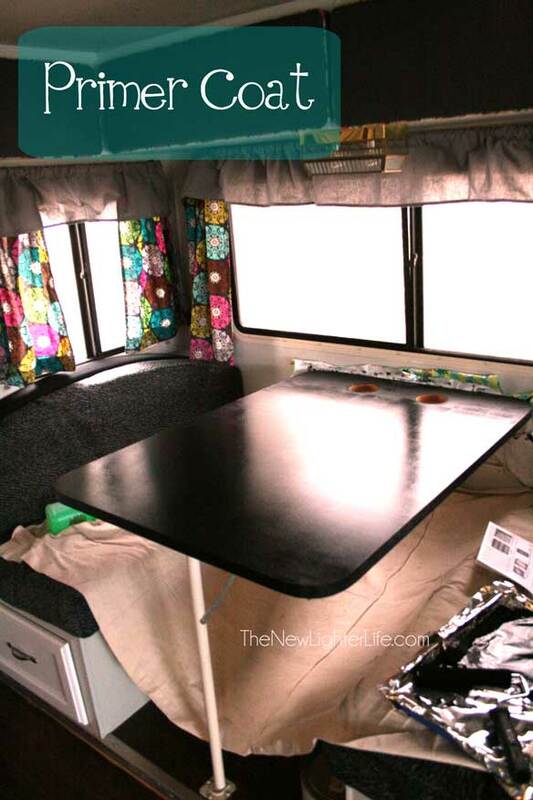 But if we didn’t point out to you in the camper, you’d likely never notice the patch job. The stairwell was previously completely covered in carpet. In order to get all the adhesive off of the stairs, he had to spray a product (similar to Goo-Gone) and scrap the glue off. 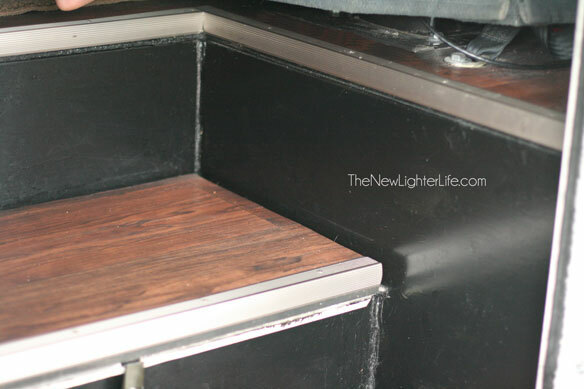 Lastly, he placed vinyl on the top of each step and trimmed the edges with a metal transition strip. That open step is where the batteries are housed. Once the cover is on, you can see the vinyl on those 2 stairs. The picture below shows the trim that Mark placed around the outside walls where the vinyl was placed. And here is a closeup of the finished stairs with all the transition strips in place. Up until this writing, I’ve not convinced Mark to remove the cab carpeting and recover the doghouse (the engine cover between the 2 front seats). Truth be told, we don’t even notice the old upholstery/carpet. Hardly. Maybe someday, but for now our flooring is complete. *UPDATE* After several months of use, I have to take back my recommendation of this product. Please click here for what our counters look like now. 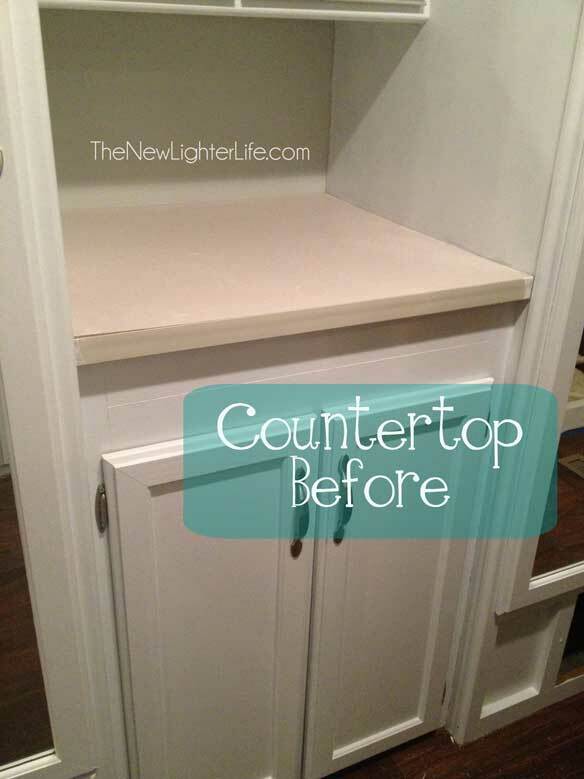 After we did the transformation of the cabinets with Nuvo’s cabinet paint it was painfully obvious that I needed to update the countertops. 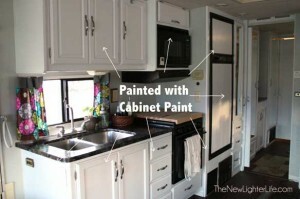 In all honesty, I hadn’t even considered the counters when I chose to do the cabinets in Platinum White. 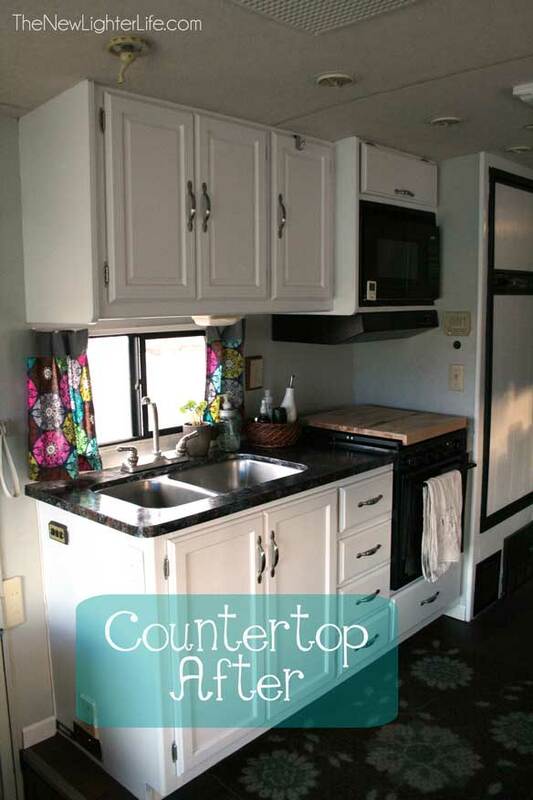 But as you can below, the counters looked dingy next to the updated cabinets. So I contacted Giani Granite, which is the same makers of Nuvo Cabinet Paint, and they agreed to send me a kit to update our countertops. 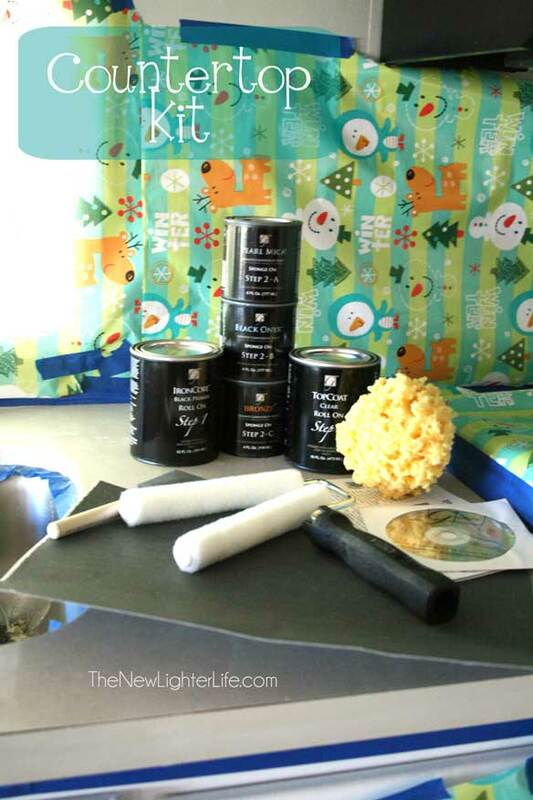 I decided on Bombay Black for the countertop color. I got my kit in the mail and was happy to see it came with a practice sheet of paper. 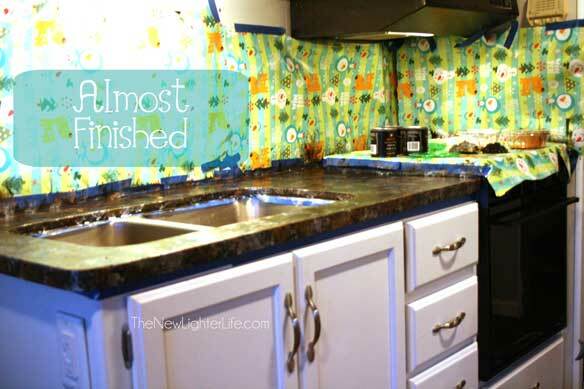 I used wrapping paper and lots of painter’s tape to protect area around the countertop. 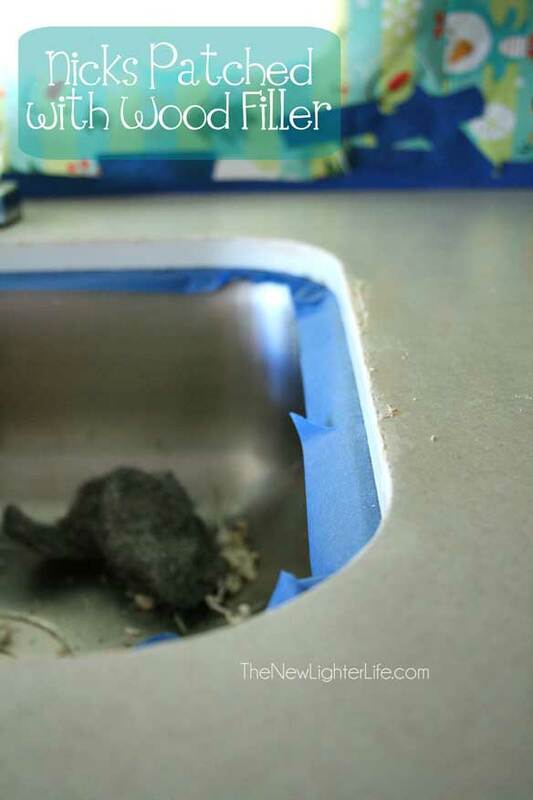 There was a little bit of prep work such as sanding and removing the plastic trim around the base of the countertop. 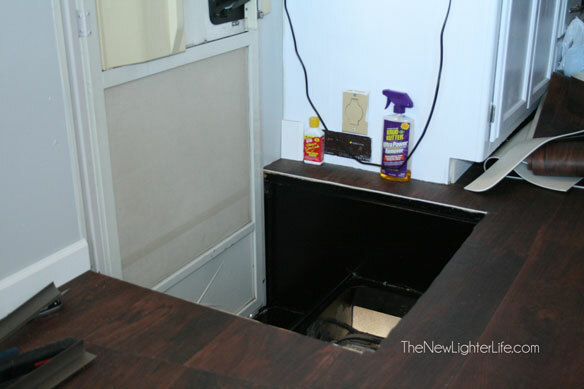 I also needed to apply wood filler to the nicked areas of existing counter, which was mostly around the sink cutout. 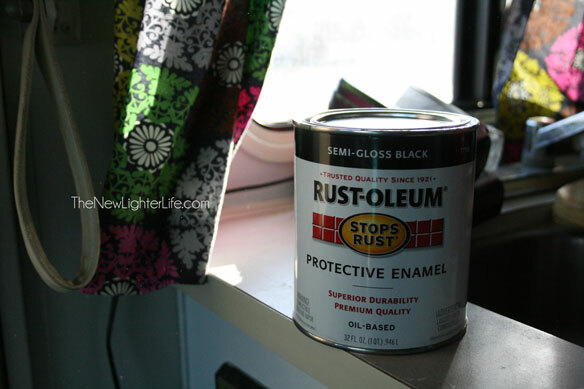 I applied my primer coat (which had amazing coverage). I decided to do the dining room table because we had more than enough primer to complete the job. While the primer was drying, I used my practice piece of paper to try the sponging method. Now keep in mind, I’m no artist. I watched the application video, which was very helpful, but I still felt intimidated. I’ve never done any type of faux painting but I plunged ahead. Once the primer had dried the appropriate time, I started sponging on my colors. It went very well I think. It was hard to visualize the end product and I just kept sponging more colors on. I didn’t want to have a uniform color so I had to go back and forth with colors a bit. As you can see, someone took the paper down too quickly and the wall got messed up. I sanded the counters after the paint had dried but before I applied the clear top coat. Above is a closeup of the countertop after 2 top coats were applied. The top coats really seem to meld the colors together and make it look more finished. I’m very happy with how it turned out! I made mistakes with applying color and noticed them later but everyone I showed the “mistakes” to didn’t notice them. My mistakes consisted of drops around the edges and splatters of paint. As far as wear and tear, the paint has held up very well. You do want to make sure water does not rest on the countertops. I noticed that when it does rest, it bubbles slightly and has to dry out to go back to a smooth finish. 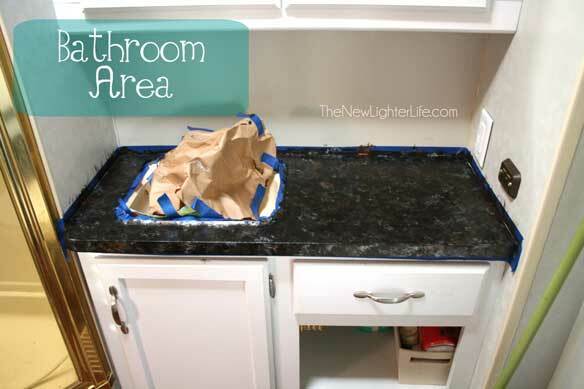 Would I do the countertop paint again? Absolutely. It was quick and it made such a difference in the look of the camper. I’m very happy with it! 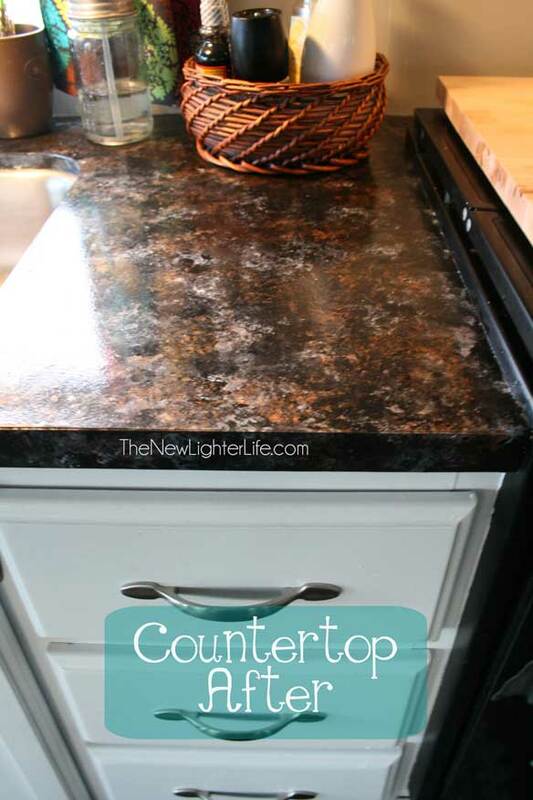 Since we have leftover paint, we can always touch up the paint if need be (we tend to be hard on countertops). 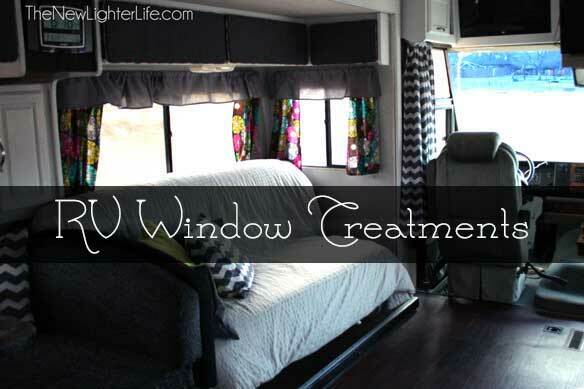 Continuing with the remodel posts, today’s post is all about the window treatment. 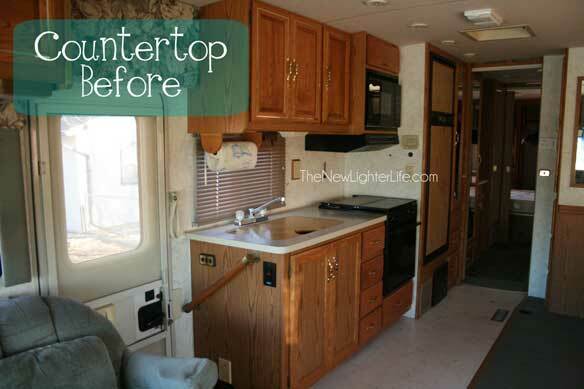 When Mark demo’d the camper, he threw out all the old cornice boxes. They were dated and we didn’t want to recover them. 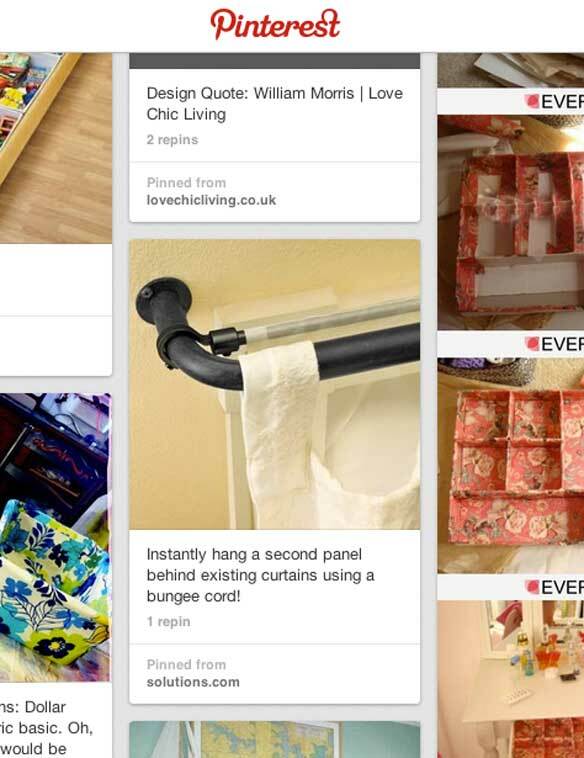 Instead, we decided that we’d reuse the privacy blinds and I’d sew new curtains throughout. 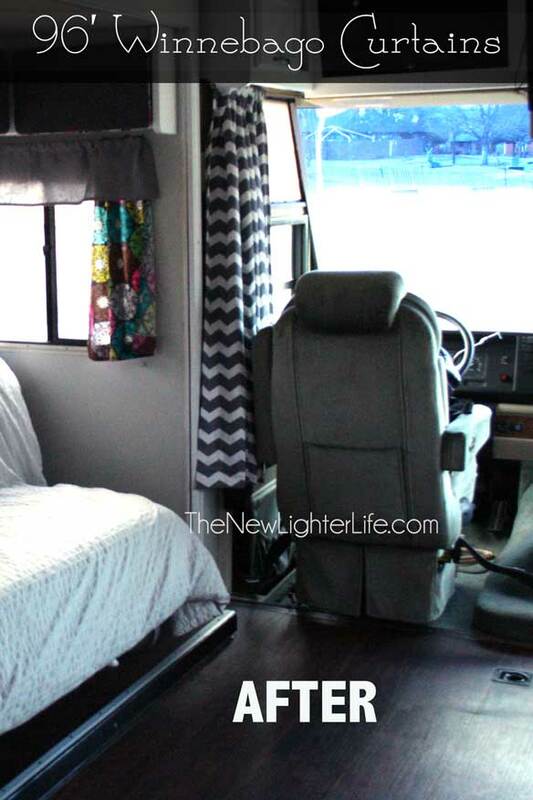 One of my best friends went with me to Hobby Lobby and helped me pick out the perfect fabric for the camper curtains. I wanted a fabric that would allow us different color options. I didn’t want it to be drab or boring. I also didn’t want it to be an eye-sore. We settled on this. I love that it has an array of colors. Gray, brown, lime green, mustard yellow, seafoam green, fuschia. I CANNOT say that Mark loves my choice. I think he used the word “girly” and accused me of trying to feminize him. Since I love him, I wanted him to be happy with the camper. I made a few adjustments and added a gray panel to the top of the curtains. I hoped it would help. But before I go into the curtains, lets talk about the curtain hardware. 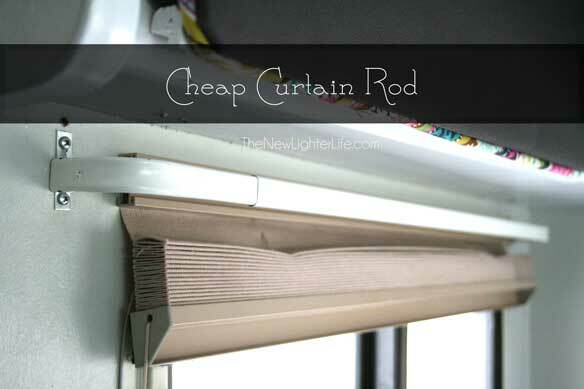 I saw this pin on Pinterest about how you can make cheap curtain rods. I went with it because I loved the look. Now in all fairness, I didn’t do it exactly as the website suggested. I bought some beautiful drawer pulls from Hobby Lobby for 50% off. Dowels would come from the hardware store but I found that I’d have to buy hardware to attach the curtain rod dowel to the wall. That pesky hardware drove my cost up per window and turned out to be the straw that broke the camel’s back. Now that may not seem like a lot but when you consider that we have 8 windows. It adds up to $70. I was even willing to pay that price because those drawer pulls were gorgeous. My MORE frugal husband put the brakes on and said that was not worth it. So I bought these cheap curtain rods for $3 to $4 a piece (depending on the length). So it cost me just $28 for our (initial) curtain hardware. Initial means I’ll go into that later. First, let’s go back to the curtain design. I have to tell you about this VERY cool blog, Ana White. 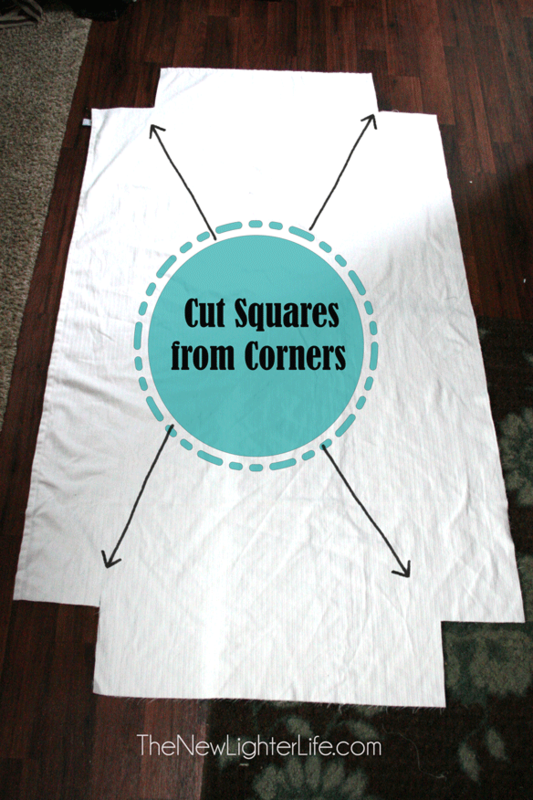 She has a tutorial up about how to make hidden tab top curtains. I loved the look of her curtains! 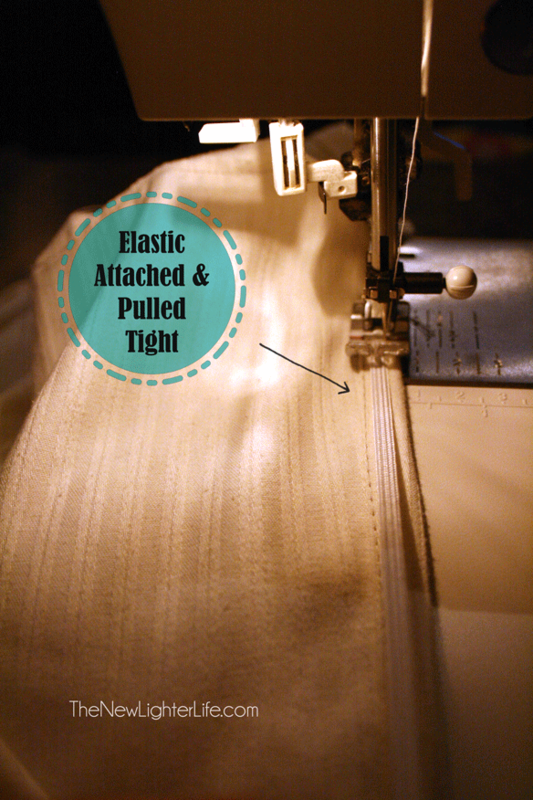 So clean and a simple way to sew in hidden tabs. The design makes it so the fabric is not bunchy at the top. (I may sound slightly picky) I decided that was exactly how I wanted my curtains to be and I pressed ahead on making them according to her tutorial. As I mentioned earlier, I tried to tame down some of the wild colors of my main fabric and appease Mark by adding a gray panel to the tops of the curtains. They were a little more work, but I was sure the results would be worth it. 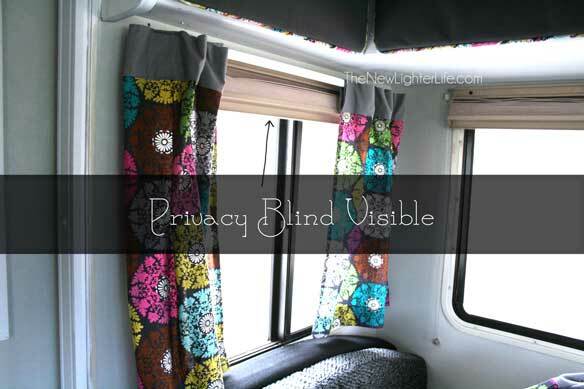 The problem was, I hadn’t considered the fact that the privacy blinds would be visible when the curtains were open. Once we got the first curtain up, I realized it would not do. Bummer!! 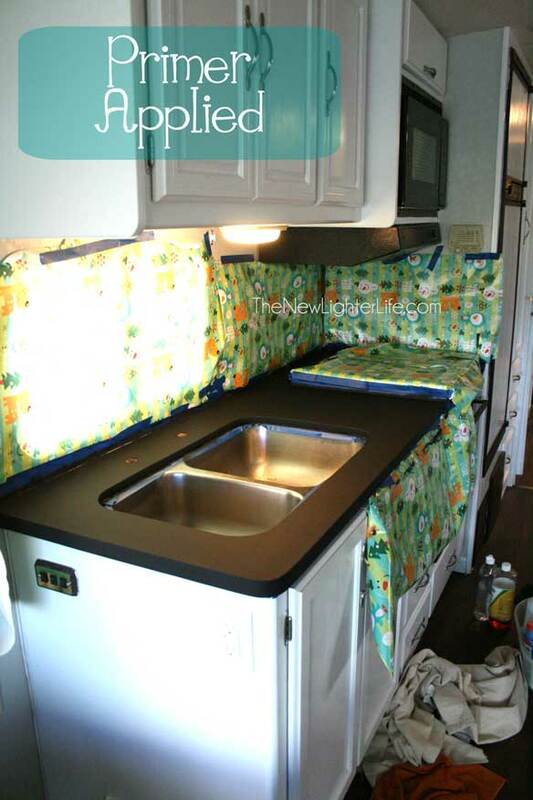 I really didn’t want to have to put a valance up and I wanted the benefits of the hidden tabs. 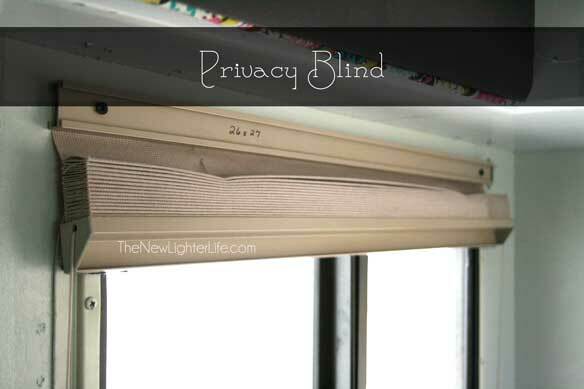 I just couldn’t stomach seeing the privacy blinds all day long when the curtains were open. So I made valances, not my first choice obviously but I’m happy with them today. I used the same gray color that was at the top of the fabric and my valance hangs down about 7 inches. But now we had a problem with the cheaper curtain hardware we had bought. 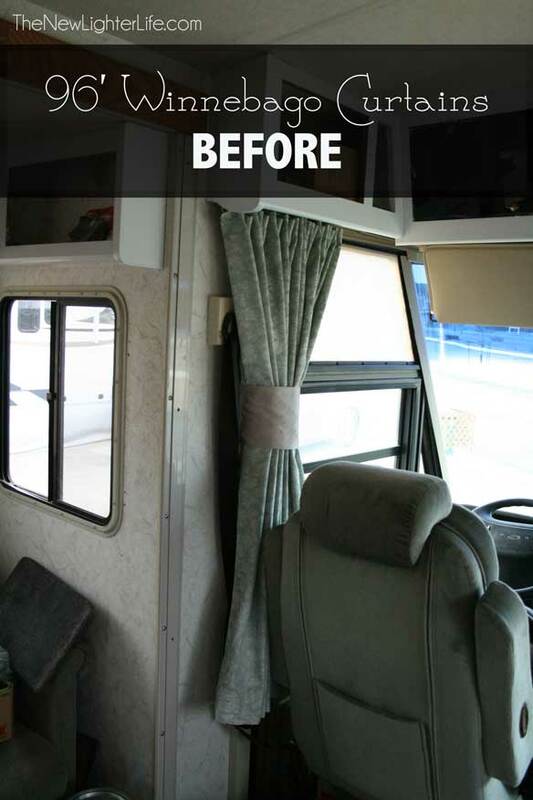 The valance would need to go on the cheap curtain rod and we needed something for the curtain panels. 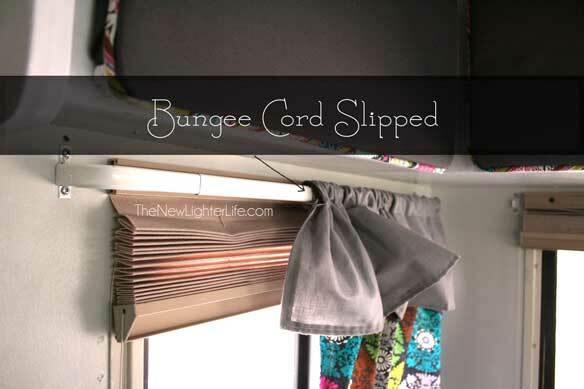 I found this pin that talks about using a bungee cord for making a curtain rod behind a regular curtain rod. 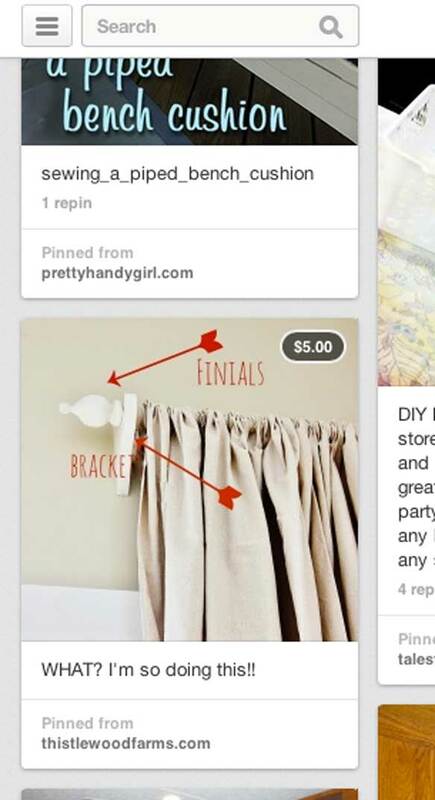 The pin actually links to some expensive curtain rod, but the description is all we needed. So Mark went out and got about $16 worth of bungee cords. We got them about 5 or 6 inches shorter than the curtain rod so there would be enough tension to hold the curtain up and snug. Our fix? 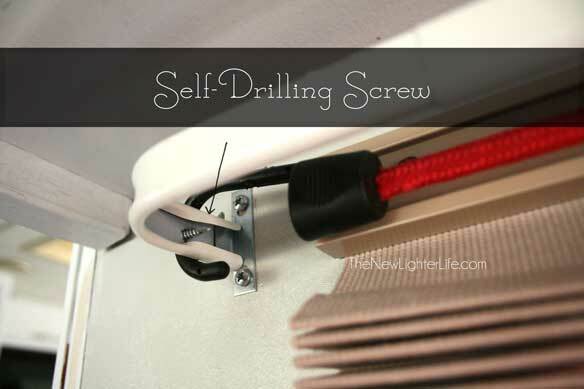 Screw in a self-drilling screw to the end of the rod so the bungee cord can hook to the screw and not slip. Here is another view of a self drilling screw tip for those of you who may be as unfamiliar as I was. I do like how the hidden tabs make the curtains lay underneath the valances due to the hidden tabs. In a regular stick built home, I do the same tutorial in a heartbeat. So that covers our main window treatments but we still needed to update the front window curtains. 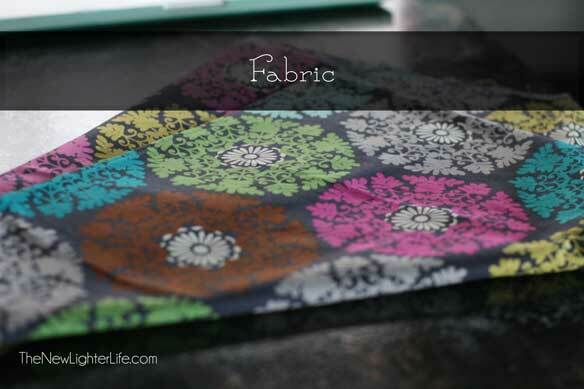 The original fabric before was like a seafoam/blueish embossed rose color. I decided to layer a chevron fabric onto the existing curtains because I wanted the added insulation and didn’t want to have to reinvent the wheel in this area. 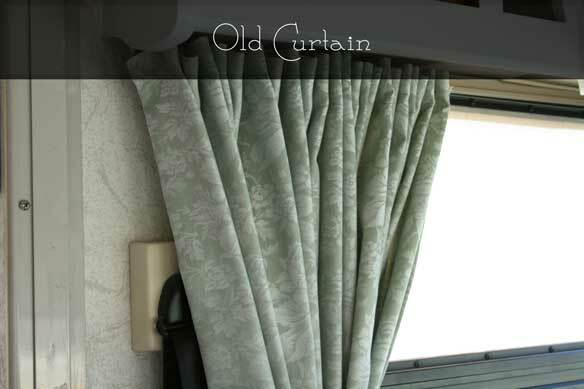 I’ll tell you that I laughed at the person who sewed the original RV curtains. Yep, I did. I thought maybe they had a rough night or they got trained on the particular curtains that went into our RV. Pride. You know what they say, pride comes before the fall, (which I’ll go into in a bit). 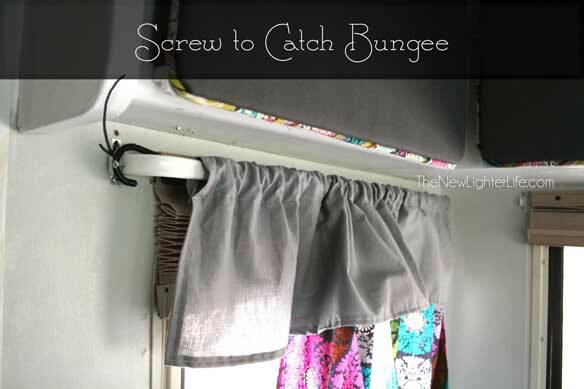 The curtains were sewed so sloppy and they were a mess when it actually came to taking off the curtain hardware. The hardware I’m talking about is the glide tape. 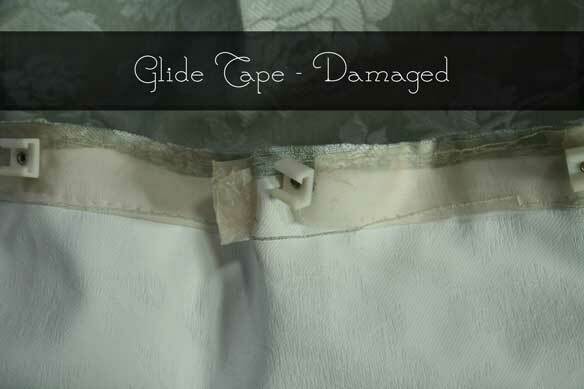 I really couldn’t work with the existing glide tape because the plastic was cracked, brittle, and falling apart. I had actually hoped I could glue it and patch the glide tape but it quickly became apparent that it wasn’t possible so I got out my seam ripper and went to town to remove the tape and rig something up. Since it was so old and hard to remove, I wasn’t able to salvage it. I ended up ripping the glide tape off. I ordered 3 packs of 72 inch glide tape from Amazon. The 2 curtain panels measure 86 inches each. So we needed to use part of a 3rd glide tape for each of the panels. 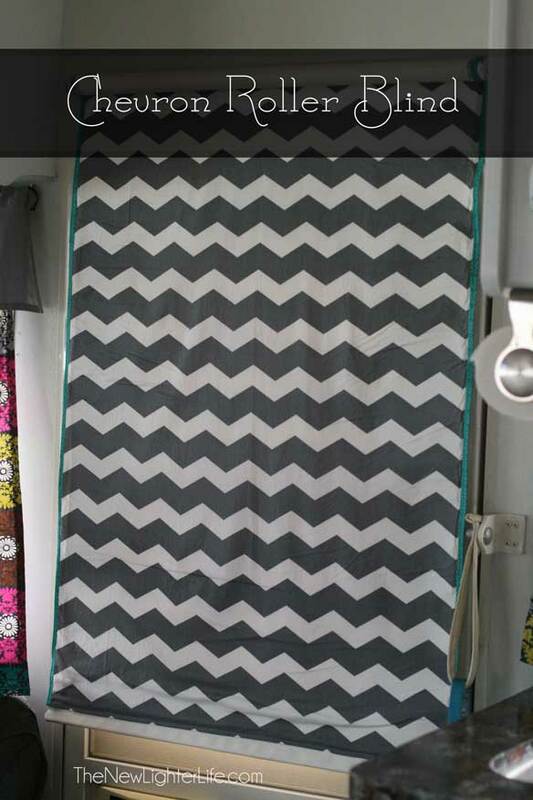 After I pieced my chevron fabric together to get it wide enough I sewed the panels to the top and sides of the existing curtains. 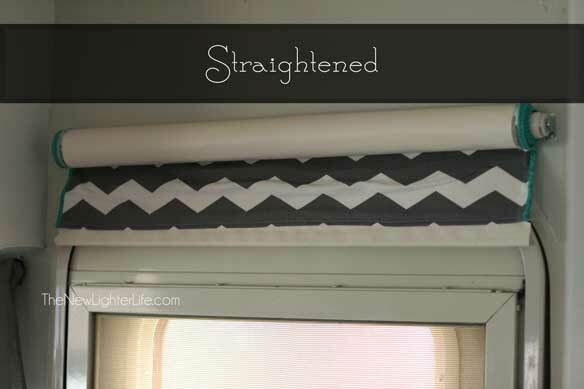 Next I sewed on the first 72″ strip of glide tape and then I started at the opposite end of the curtain top and sewed the other glide tape on (going towards the direction of the already attached tape). I did this to make sure the bracket was positioned near the edge of the curtain and it wouldn’t sag at the end. So this is the part where I describe my fall after pride. 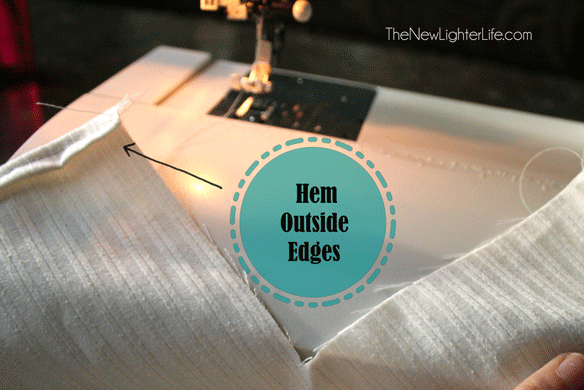 Sewing on the glide tape was comical. For the life of me I couldn’t keep it straight. There is really no way to pin it to the curtain since the plastic on the tape is so thick. You just have to wing it. I tried 3 different feet for my sewing machine and finally settled on my zipper foot. It was tricky and it wasn’t pretty, but the glide tape was attached. 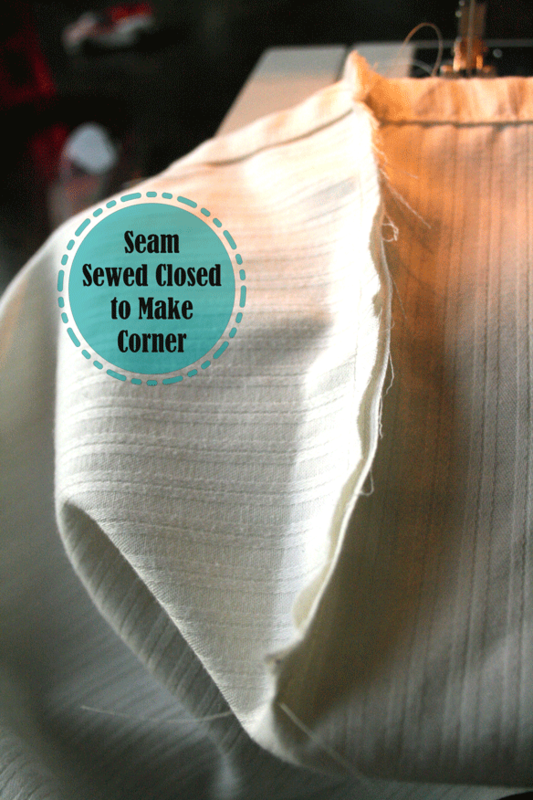 Once I hung the curtains, I pinned the bottom hem up, removed the curtain and sewed along the pinned hem. The front curtains are busy, crazy and make me twitch. I love chevron, but this was too much. I’m hoping someday I’ll muster the time to add a solid panel somewhere in there. I think that may help stop the motion sickness when the curtains are closed at night. But during the day, they don’t look half bad. 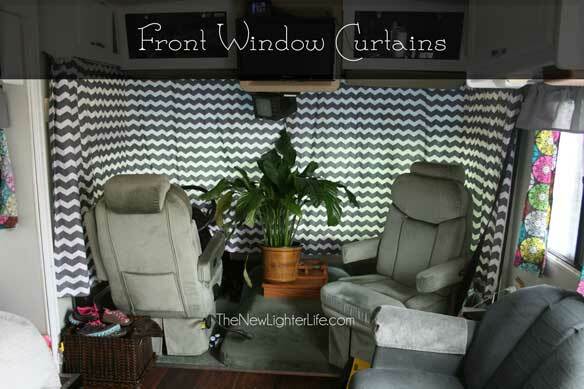 So here is the before and after of the front curtains. Curtain tie backs were added later to keep the curtains contained. Now I have one last thing to show you about window coverings. We have a roller-blind at our door and it was just a plain white plastic. 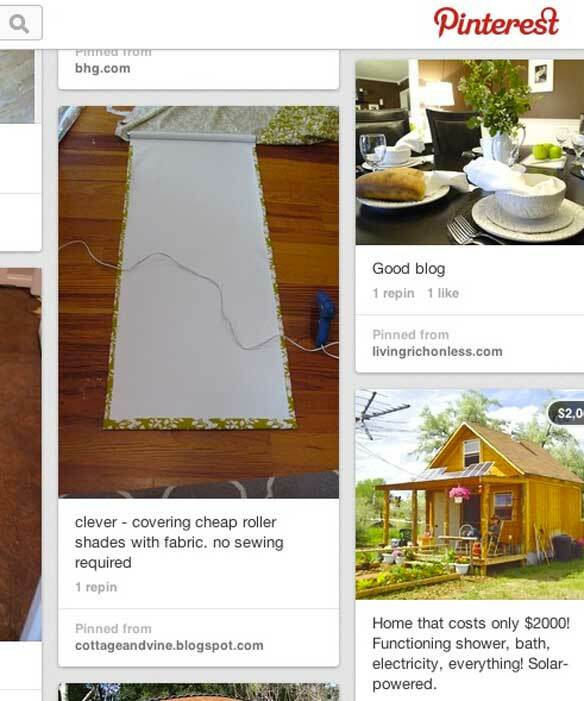 I know I sound slightly obsessed with Pinterest, but this time, it failed me. I had to take as much glue off as I could and remove the fabric. Since I put most of the hot glue on the edges, I actually had to trim the roller-blind edges away. 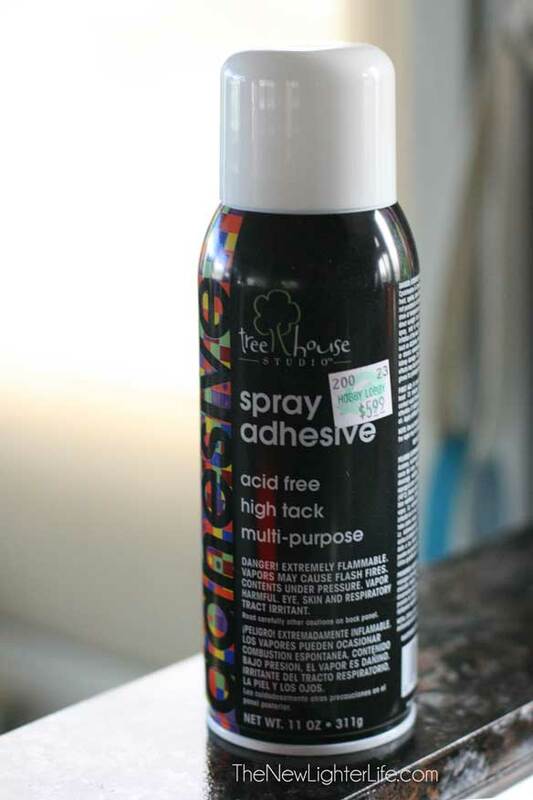 The only way I could find to adhere the fabric effectively was by using this spray adhesive. And here is the after of the roller-blind when it is down. 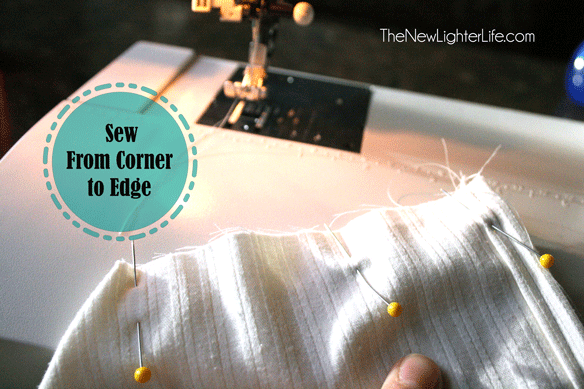 The reason why I have a green trim on my edges is because I was using fabric scraps. So I just sewed trim on both edges of my chevron piece to make it wide enough. I centered the blind over the fabric and voilà. 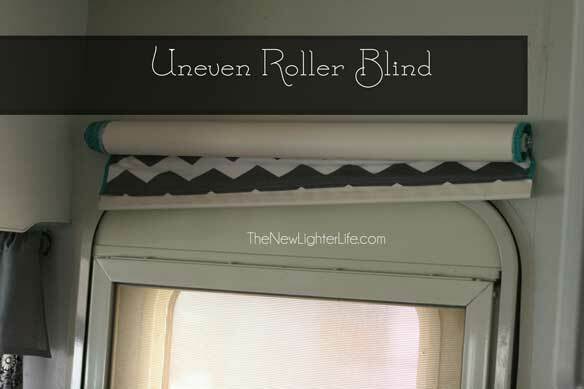 A fabric covered roller-blind. The fabric is bunchy and I’m not happy with it. Basically this just so show you how this doesn’t work. Someday I’ll figure it out. But for now, it works fairly well. We have to readjust the blind by tugging it when it’s rolled up. One area I haven’t addressed is the kid’s bunkroom. Honestly, I don’t like the curtains in there. I could go on an on about why I don’t like the curtains but just trust me, it’s not worth sharing. I may redo the curtains in there, but for now they do the job and the room is fairly dark, (I did use blackout fabric). Since that was the goal, mission accomplished. So that’s it on our window coverings. Our friends call us hippy or gypsy-ish. I have to agree, it has that feel. If I ever get tired of the curtains, I’ll go with more neutral curtain fabric. I still love that it gives us decorating options with all the colors and you know, we are sorta gypsy-ish. When we bought our Winnie, she was full of old light oak cabinets and a lot of fake wood panelling. 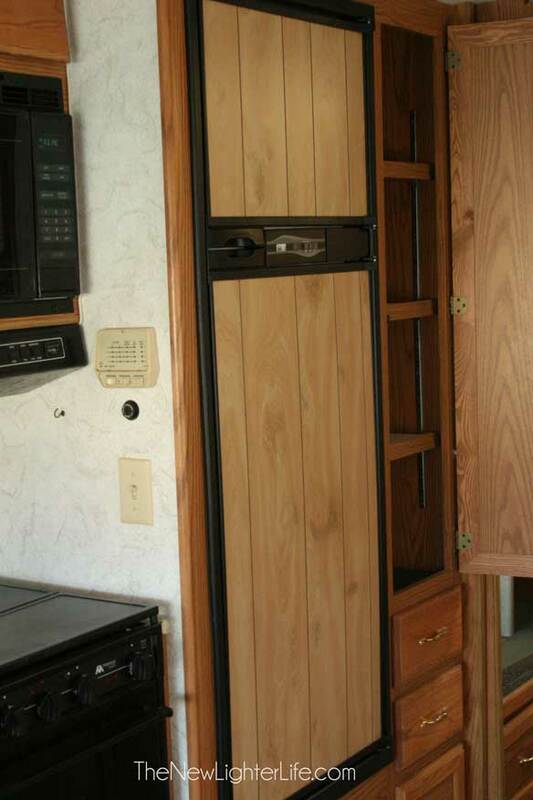 Even the fridge had paneling. 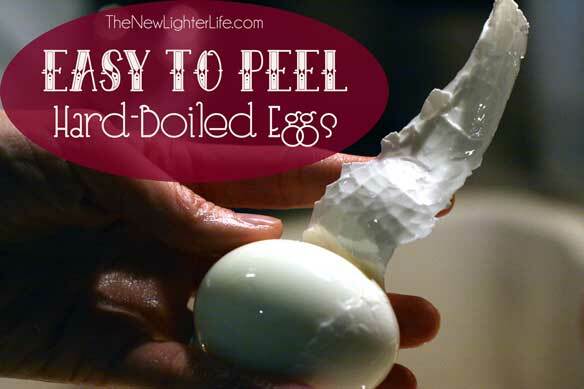 I hated peeling hard-boiled eggs, at least until I found out about this trick. We tried all sorts of ways of getting the shell off of hard-boiled eggs. Adding baking soda, baking eggs in the oven and soaking in ice water, and different cooking times. We’d end up with half the egg being torn off with the shell. 9 times out of 10 we’d have mauled over eggs. 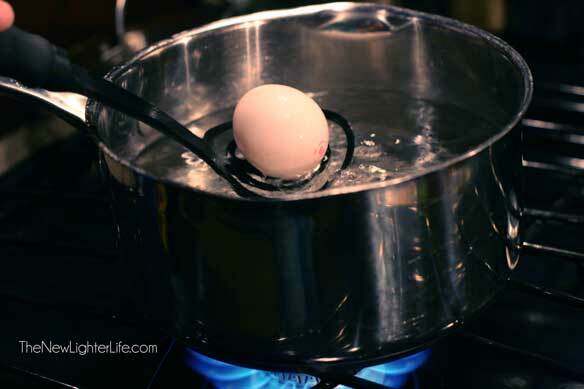 But our egg peeling woes came to end when one of Mark’s coworkers gave him the secret to hard boiling eggs. 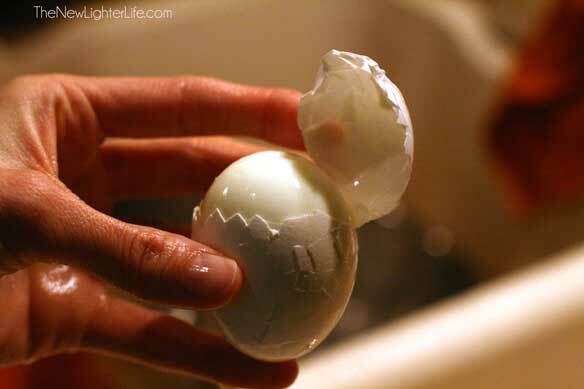 The results perfectly to allow the shell to easily release from the egg. We’ve tested it out half a dozen times already and declare this method a winner. 1. Bring a pot of water boil. 2. Add the eggs to the boiling water with a slotted spoon, (or Mix N. Masher) and set the timer for 8 minutes. 3. 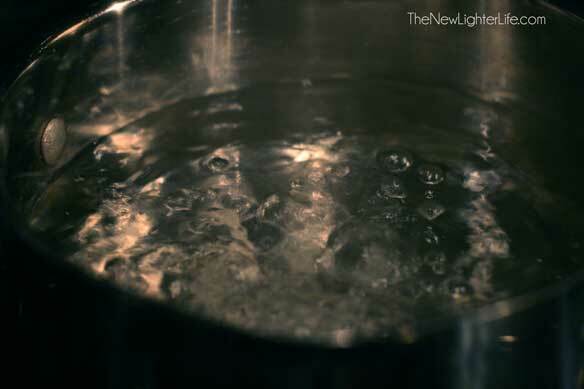 Cover the pot and let water come to a boil. 4. Once timer goes off, you can turn it off and let the eggs cool on the stove for at least 20 minutes. This is how I peel them and I think it works the best. I crack one side of the egg and roll it along the counter as I slightly press down. 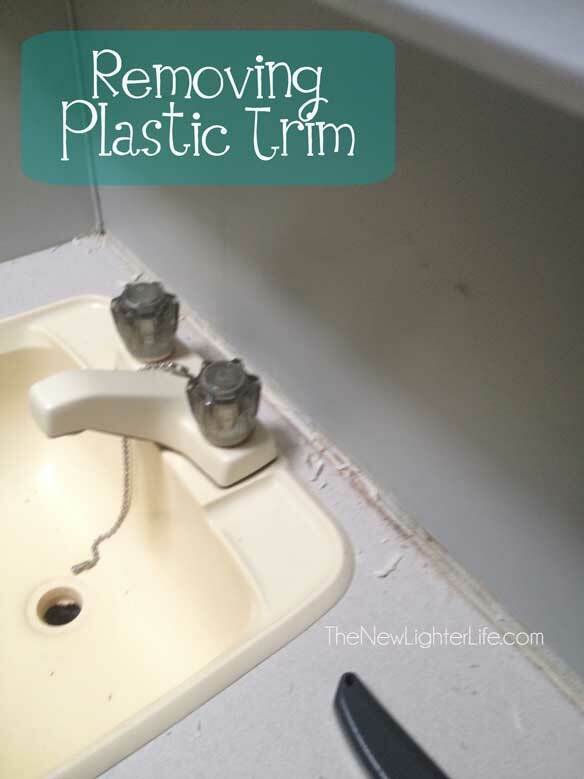 This will crack the shell all the way around and it’s super easy to peel off. There you have it. From people who obviously eat too many hard-boiled eggs.